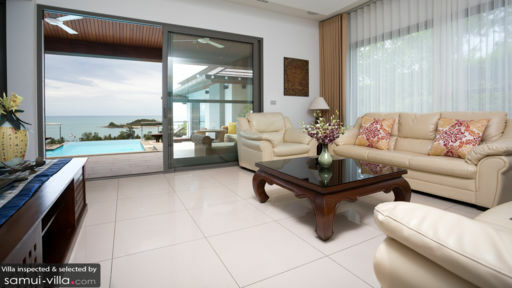 Villa Ocean View provides spectacular views across the ocean and outlying islands along the Gulf of Thailand. 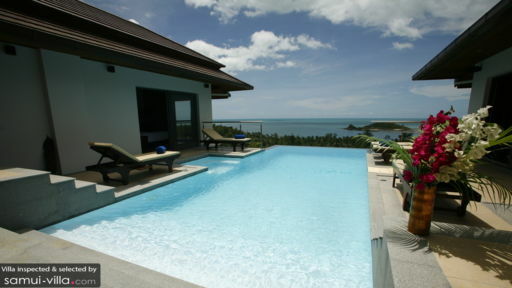 Close to Choeng Mon beach, Koh Samui, Villa Ocean View comprises five bedrooms, plenty of common areas and an infinity pool located over three floors of the villa. With lush tropical gardens and mesmerising views, the villa provides you with a complete experience where you can spend time lazing by the pool or challenge your friends to a game of billiards in the games room. Villa Ocean View has something for everyone including children and grown-ups so each and every person can have a wonderful time. In order for you to enjoy each corner of the villa, the five bedrooms are located over the three floors. The master bedroom and another room are located upstairs while two are found at pool level and the remaining bedroom on the lowest floor for more privacy and garden access. You can take your pick as each bedroom allows wholesome sea views and some have a terrace as well. The bedrooms are furnished with king-sized beds or singles that can be joined as one king bed upon request. Interiors are luxurious with traditional colours and opulent gold accents. The air-conditioned bedrooms come with ensuites as well so you have ample time to get dressed avoiding any brawls in the morning. The gradient blue water of the infinity-edge swimming pool with Jacuzzi offers a respite from the tropical warmth in Koh Samui. Villa Ocean View stays true to its word and gives you front-row access to some of the most beautiful sights on the island. The pool deck comprises deck chairs in true tropical fashion for sunbathing, lazing about and enjoying peaceful moments. An outdoor shower allows you to rinse off before and after a dip. The terrace beside the pool is furnished well with wicker sofas and chairs featuring bright yellow colours – an idyllic setting for your morning tea. Villa Ocean View is spread over three floors and you have access to modern interiors and lush outdoors with tropical gardens towards the back of the villa and the pool out front. The living area is steps away from the pool with glass doors that slide open to reveal the sea view. Furnished comfortably with beige sofas and recliner-style chairs, the living area is designed with floor-to-ceiling glass doors for ample views. Modern comforts include a TV, DVD player and air-conditioning. Guests of the villa have access to a games room with a billiards table and a TV as well as a pre-installed sound system that will make for some great parties by the pool and the perfect soundtrack to your romantic evenings. Dining is available wither indoors or out on the terrace for an alfresco experience. After all, what’s a tropical holiday without a meal under the starry-night sky? Prepare your meals in the fully-equipped modern kitchen with utmost ease or alternatively, you can book a private chef to do the same for you with more flair and local flavours. The villa offers plenty of services to its guests including cleaning and upkeep to maintain the property. The staff will cater to your needs with pleasure so you can book a massage in-villa or rent a car with their help. Estate facilities are accessible to guests such as fitness centre. 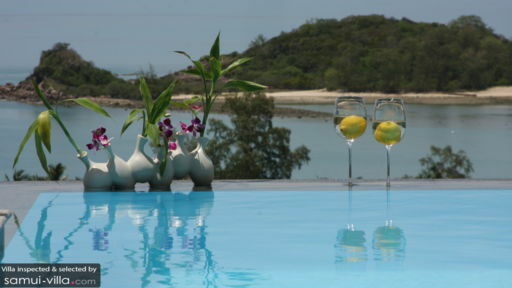 Found near the shores of Choeng Mon beach, guests are in for a treat as this is the most popular part of Koh Samui. With Chaweng beach and Fisherman’s Village only a short drive away, you can easily explore the nearby areas and grab a bite to eat at one of the beachside cafés or restaurants like Happy Elephant or Secret Garden. Beach Clubs near Chaweng include [email protected] and Hush Bar.